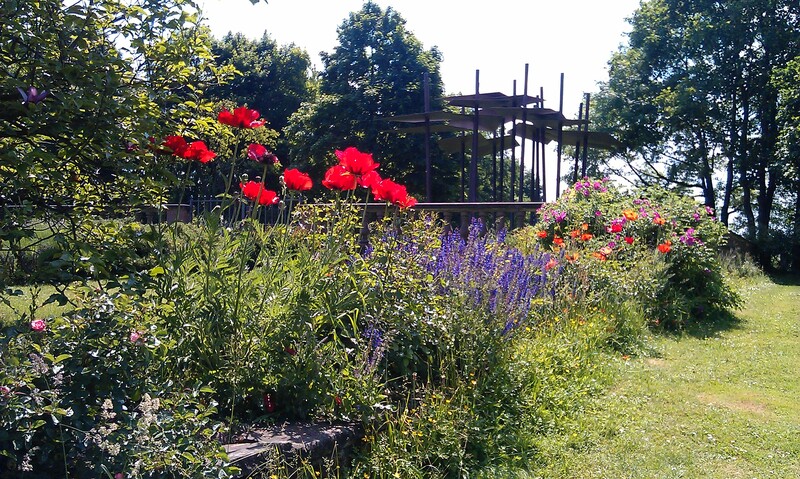 I promised you in my first post about Darmstadt that I would write another post on Darmstadt’s parks in summer. And as I was back home for my mum’s birthday this weekend, I took the chance to enjoy Saturday’s most beautiful weather, grapped my dad’s bike and went for a little tour around Darmstadt’s parks. It was just so lovely and it brought back many memories, to be sure. I started close to my parents’ home at the Rosenhöhe. This is a historical park at the edge of town, surrounded by fields. 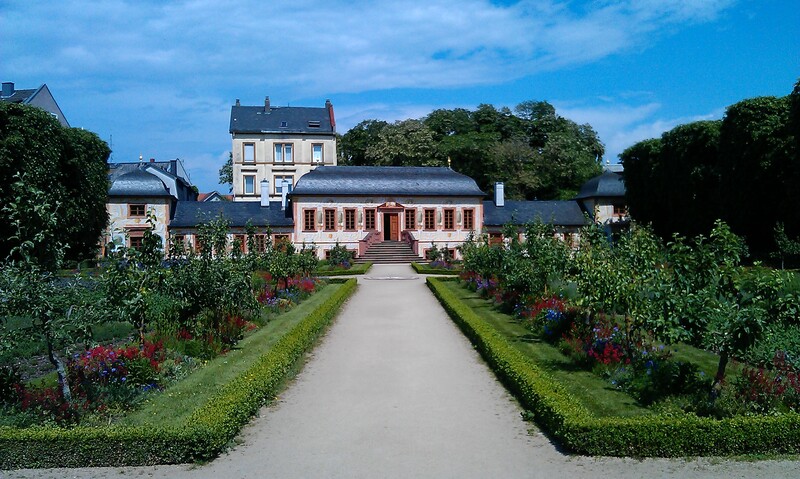 It is from the early 19th century with lots of old, exotic trees, a burial area for members of Darmstadt’s Archduceal family and a beautifully designed rose garden. Unfortunately most roses were not in full bloom yet and although the rose garden does not seem to get as much care as in the past and looks a bit overgrown, it already looked very lovely. On my way out of the park I passed the site where a palais used to stand that burned down during WWII. Today only a doorway and hedges, planted where the outside walls of the palais used to be, remind of this building. Very close to the Rosenhöhe on the way into town is the Woog. 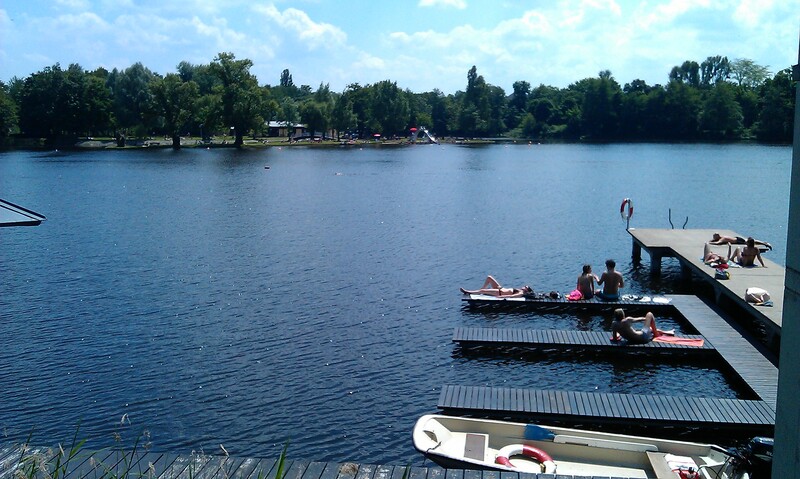 This is Darmstadt’s inner city lake with a public swimming pool. I’m more of a tiled man-made rather than natural lake swimmer but I spent one summer on this lake and passing it always reminds of it. 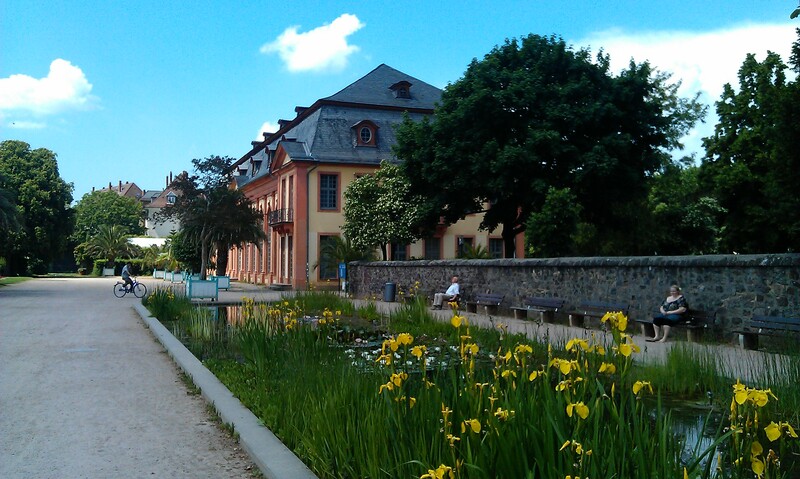 You can reach the lake either through the public pool on an island, through the so called “Familienbad” the rebuilt expressionist public bath or from Darmstadt’s Youth Hostel. Next I went to a park that is deeply rooted in my memory. My high school was just around the corner and we spent lots of time here, before and after school and during lunch break but also during many summer nights: the Orangerie. Designed and built in the 18th century as a baroque garden it still shows its strictly lined designs combined with exotic plants like palm trees. 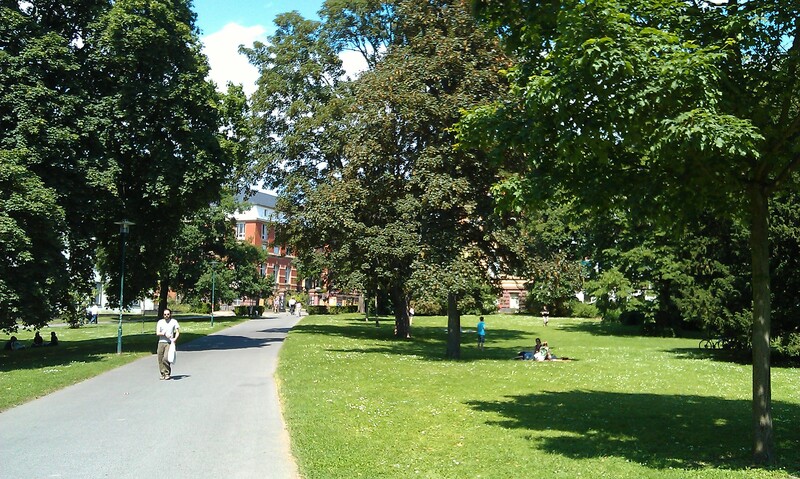 What I like best about parks is sitting down on the grass for a picknick or to catch some sun. This is actually not allowed in most parts here. Of course this did not stop us in the summer nights but during the day you do not see as many people here as in other parks. It is located in the former village now part of Darmstadt Bessungen. And very close by is another park. 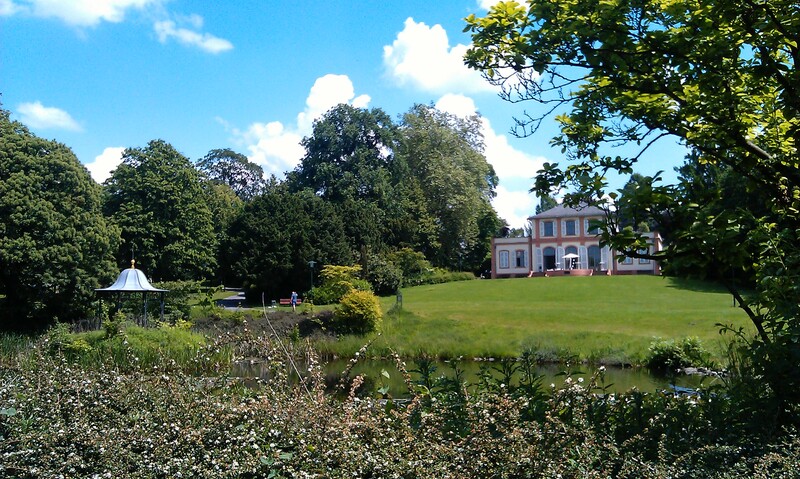 This small park with a pont and a little palais is Prinz-Emil-Garten. Named after a prince and sporting a cute little palais and a pont I have no memories towards this park because I have hardly ever been there during my time in Darmstadt so I did not linger long. Next on my list was the Herrengarten in the city center. This is Darmstadt’s oldest public park, situated behind the still closed Landesmuseum and the old theatre now archive as well as very close to some of Darmstadt’s university buildings and by the way the best place to watch the fireworks on the Monday of Heinerfest, Darmstadt’s big city fair. 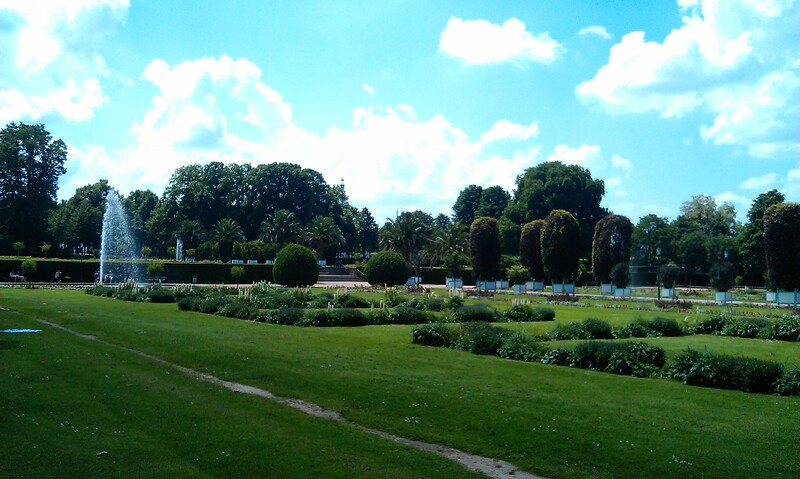 Here I first went into one of the smaller sections of the park, named Prinz-Georg-Garten. To be honest, I had never ever been there before. I like to tell myself that when I lived in Darmstadt it was closed. It belongs to a small palais and a garden building that now houses a public reading room. The Herrengarten itself is far more familiar to me. I passed it on my way to the city center or school whenever I was going by bike. There are always many people sitting on the grass, enjoying the sun here, far more than in any other park where sometimes sitting on the grass, as it is part of the design, is not even allowed. And being so close to the university you can find people here all week long, many studying in the sun. 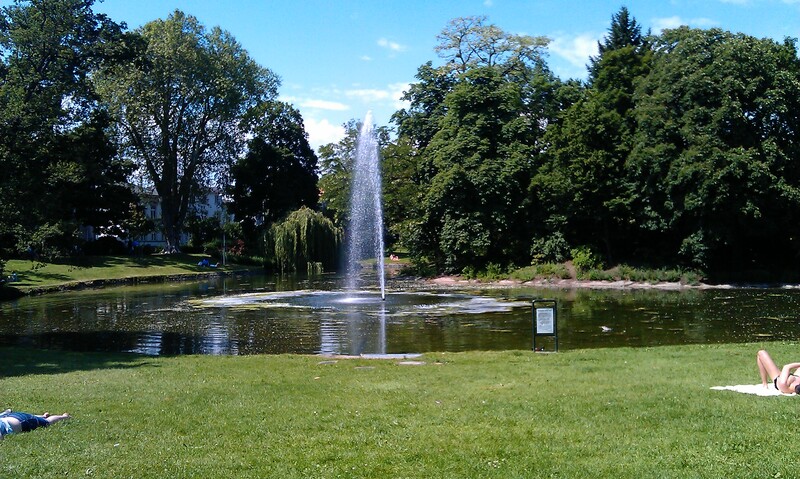 You see, Darmstadt has lots of lovely parks and is especially nice in the summer. I never thought I would say that once but come and visit my hometown! 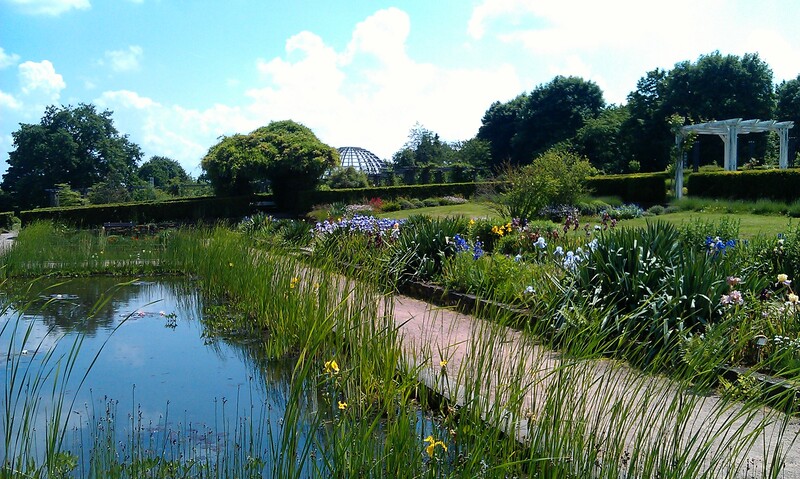 This entry was posted in Germany and tagged Darmstadt, Park, Short Trip, Summer by kathatravelling. Bookmark the permalink.